The rules to the new game by Bruno Cathala and Ludovic Maublanc have just been published on Days of Wonder’s site for the game here. I do like the look of this game and it looks as though players will need to carefully balance progressing their plans with not being too greedy. Oh, and watch out for the crocodiles. Also, the back page makes reference to online play. It doesn’t specifically mention Cleopatra (although sign-up is via www.cleopatragame.com) but, unlike Shadows Over Camelot, it doesn’t say there are no plans for an online version. 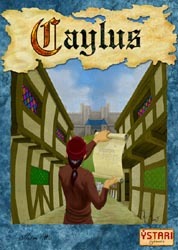 This was our second go at Caylus, this time with four players, all of whom had played before. Unlike last time, this was a much less cut-throat affair as the person claiming the free Provost move tended to move him forward way down the track. The game also saw many more stone buildings built, particularly as I built the stone mason on the first turn and Nige next built the double stone production building. I decided to try and get the valuable Prestige buildings into play by building the lawyer and upgrading to a residential building. Unfortunately, the bailiff was moving so quickly (2 spaces every turn except one) that the game was virtually over by the time I was in a position to build my first blue building. Mark K and Mark G were concentrating more on castle building than Nige and myself and they got some very useful royal favours: mainly income and victory points. Mark G also made good use of accumulating gold for end of game VPs and this proved the critical factor with Mark G racing well ahead of the rest of us. This game played much quicker than previously, partly as a result of there being fewer players, partly due to our greater familiarity with the game and partly due to the â€œjet-propelledâ€ bailiff. We finished in about 2 hours 15 minutes. I found the game to be even more enjoyable than last time and rate it a very strong 8. There are still lots of different strategies to be tried out. I was a bit disappointed that the game didnâ€™t last long enough for my prestige building strategy to work but next time Iâ€™ll know better and either ditch that route or try and slow the provost down. Well, I think I’ve got around the comments problem. It was something to do with Spam-Karma so I’ve deactivated it and taken the opportunity to upgrade my WordPress installation, the latest version of which includes the Akismet anti-spam utility. Depending on how that performs, I may get the newest Spam-Karma as well (assuming they will work together ok). If anyone sees any problems with the site over the next few days, do please let me know via the comments or by e-mail garry(AT)trickylight(DOT)co(DOT)uk. There seems to be a problem with the comments section of the blog. On submitting comments, a long list of error messages appears, although it looks as though the comment still gets posted ok.
I’ll try and have a look at this over the next day or two. This week, six of us met at Johnâ€™s house. 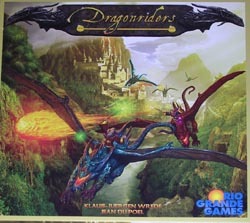 One of last yearâ€™s Essen releases that I have not yet played is Dragonriders by Klaus-Jurgen Wrede and Jean du Poel and published by Rio Grande. The game is a dragon race around a twisting circuit, with riders casting spells to try and get themselves to the front and win the one-lap race. Each player simultaneously sets their speed dial (accelerating or decelerating by up to 300mph) and decides whether to play a magic card. Then in race order, players move and cast their spells. Movement is carried out using a measuring stick matching your chosen speed, which both sets how far you travel and the degree to which you can alter direction. The measuring sticks have notches cut into them to restrict manoeuvrability, the restriction growing as your speed increases. This is a very clever device and also helps to show whether you flight path safely avoidst the walls of the course or not. The spell cards allow you to do things like hitch a ride from a dragon in front of you using a lasso or through fireballs at a leader to run him out of energy etc. The twists and turns mean that often your dragon takes damage and loses energy. If it loses too much, it becomes exhausted, restricting its speed until it regains some energy or drops out of the race entirely by losing more energy. Scope for being very nasty to an opponent here. The race continues until first across the finish line wins. We made our course up with some nasty bends at the beginning and this meant things were very tight with people jostling for position. Very tight is a problem in this game as the dragon figures are so light and impractically shaped that it was virtually impossible to move a dragon without another being moved accidentally. You have to take this as a bit of fun as everyone will mess up â€“ guaranteed. Exact precision is a no-no for this game. Taken in the right spirit, itâ€™s fun watching â€œall thumbsâ€ Nige trying to move without at least half the field being bashed out of position. The other thing we thought could be improved is the penalty for crashing, which seemed too light. Cutting speed to 100mph but then allowing the player to immediately accelerate to 400mph is too forgiving; we thought the next turn ought to remain at 100mph. As it was, leader Phil was able to plough into a wall on the final corner at full speed and then next turn move far enough to cross the line easily ahead of the rest of us. 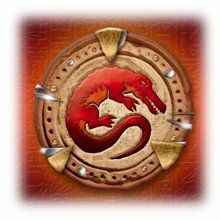 Dragonriders was a game we had mixed feelings about. The game was good in concept and we were really impressed with the movement device. However, it was much too fiddly and the dragon figures were just so impractical for the way the game was meant to be played; some nice plain wooden hex pieces would have been much better. If we could fix that and tweak one or two of the penalties, it might be worth playing again (probably with a more forgiving start to the course as well). From one race game to another. 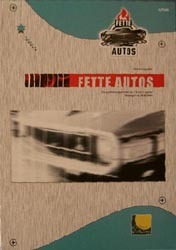 Fette Autos has been out a few years now. 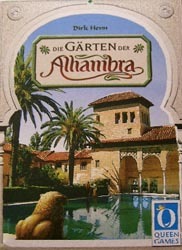 Designed by Heinrich Glumpler and published by Edition Erlkonig, the game uses cards to simulate the acceleration, braking and overtaking in a car race, using relative positions (similar to Kniziaâ€™s Formula Motor Racing) rather than movement around a track. The game is played over 8 rounds, each round representing either a straight or curved section of the track. A playerâ€™s speed is shown by three cards laid in front of him. In each round, players firstly have to change one of these three cards as dictated by the track section they are negotiating. They also receive movement chips if the symbol on their cards then matches that on the track section. These chips are used later to assist braking or overtaking. Players then get the chance to change one of their cards for a better one from their hand to speed them up or slow them down depending on the speed limit for the track section. If their cards exceed the speed limit, they either have to pay chips to reduce their speed temporarily or execute emergency braking (they permanently lose a card from their hand and replace their highest speed cards with ones drawn from the deck until they fall within the speed limit). Finally, each player has the chance to overtake cars in front of them by adding chips to their current speed and comparing it with the speed and chips of the car in front. After 8 rounds, whoever is at the front is the winner. In our game, we started off feeling our way. This wasnâ€™t helped by the fact that I had got a rule wrong but it didnâ€™t affect things too much. On the third round, the first straight appeared and I made a big move, coming up from fourth place to take the lead. However, I lost out in the next curve by not being able to brake sufficiently and had to execute emergency braking. John had to do likewise. Nige at this stage was pretty close to the back but was doing well at matching track section symbols and gaining lots of chips to help his overtaking manoeuvres. Things worked out really well for him and he was able to gradually move through the field and take to the front going into the final turn. Fortunately for him, he still had enough speed left to see off the challenge of Mark K and take the win. Well played. My car was obviously suffering mechanical problems at the end as I dropped back to fifth position even behind the neutral â€˜Old Proâ€™ car. I quite liked Fette Autos. Manipulating your hand to be able to get the right cards down to take chips seemed to be the key and Nige did this better than the rest of us. It was quite a nice different take on car racing and it would be interesting to see how it played with fewer players. Interestingly, you can even play it solo with 6 neutral cars. I’ve just gone through my game collection and marked up all those that I’ve never played. The total came to 114. That’s a very high number even for someone whose collection is over 600 games. Looking at the titles (the list is here), there are a heck of a lot of two player games and little card games among them. This is not surprising as card games tend to get relegated to end-of-evening fillers at club sessions. I have said it before but we must try and have the occasional night devoted to card games. As far as two-player games go, I need to persuade Jan or Chris to play more of these, although Chris has just taken delivery of a drumkit today so he may take some persuading. I’m going to track those that remain unplayed and try and bring the number down during this year. I did manage to reduce the number by two last night as we played Dragonriders and Fette Autos at the club. Report soon. The new issue of Counter arrived today. #32 means it has been going for 8 years now and it is still filled with loads of interesting stuff. 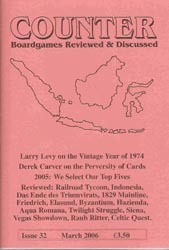 There’s the 2005 Top 5 picks from Mike Siggins, Ben Baldanza, Greg Schloesser, Richard Dewsbery, Alan and Stuart; an article from Derek Carver on how unpredictable cards can be; Larry Levy recalling what a great year 1974 was for games; John Butitta listing the main problems of being a game buyer; the usual reviews and letters plus lots more. The one thing noticeably absent is any mention of the Nurnberg releases but these will be covered in great detail next time, I’m sure. Reviews this time include among others Byzantium (noy played yet), Das Ende des Triumvirats (still waiting for an evening when there’s just 3 of us), Elasund (great game), Hazienda (ditto), Poison (nice filler), Railroad Tycoon (not Age of Steam and could be better for it) and Vegas Showdown (surprisingly very good Avalon Hill game). 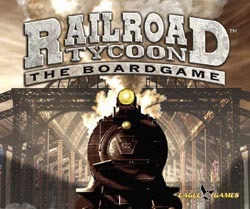 Phil had at last decided to take the plunge and buy Railroad Tycoon. Although there were only four of us tonight and RT would be good to save for when we have six, the lure was too great and we had to give it a try. RT is a re-development of Age Of Steam by Martin Wallace and Glenn Drover and published by Eagle Games. The box is packed with gorgeous looking bits and a huge board that struggled to fit on the table. RT is somewhat easier to get into than AOS and more forgiving financially. Not issuing enough shares at the beginning of a turn and being unable to pay costs at the end were potentially crippling in AoS. In RT, you can issue shares any time and this means you can concentrate more on the main body of the game, developing your network and delivering goods. RT does add a couple of elements that also change your focus a bit. You have an individual Tycoon card, that gives you a goal for the entire game (such as have the most cash or fewest issued shares) and rewards you with extra VPs at game-end if you achieve the goal. The other element is a set of operation cards that reward people who achieve certain in-game goals (e.g. to link New York and Chicago) or give a benefit to someone who take the card. Some of these cards are very powerful and give rise to a fair bit of competition. Goods delivery is also dealt with differently with cubes being distributed to all the cities at the start of the game and once all the cubes in a city have been moved out, a marker is placed in that city and once 14 cities have markers in them, the game ends. I like this much better than the AoS re-stocking action, which was always pretty weak anyway. In our game, Mark G and I started out around Chicago and the Mid-West, while Phil and Mark K concentrated on the East Coast. The East Coast looks good for building up income quickly as there are lots of short routes and Phil took advantage by upgrading to a level 3 train quickly. Mark K was very frugal with his share issue (he had the fewest shares goal, not that we knew that at the time) but took a few of the hotel operation cards, which brought him some benefit when the relevant city was utilised by someone. Phil was, however, speeding ahead and threatened to take one of the powerful city link cards which would have just about sealed the victory. I knew he had to be stopped but expected that I would lose out to the others, if I wasted a turn or three trying to block Phil. Mark K and I spent some while discussing this and perhaps distracted Phil from how I was going to complete the route instead. So, once I had performed the block, Phil didnâ€™t recognise that I could grab the city link on my next action and tried to set himself up for the following turn. Ouch! That allowed me to take 16 points from linking both New York / Chicago and Baltimore / Chicago. They also failed to block me on a 20 point link from Kansas City to somewhere else on the East Coast and that really sealed the victory for me. I thought Railroad Tycoon was overall an improvement on AoS. Some of the cards were possibly a bit too powerful but the gameplay flowed much more smoothly in my opinion. It took a bit too long but that was partly due to Mark Kâ€™s and my extended discussion on how to stop Phil. Iâ€™d like to try it again with 6 players now that we know properly how to play. A good nightâ€™s entertainment, not that Nige would agree with me claiming another win in his absence. Although Iâ€™ve played Airlines many times, Iâ€™ve never got around to trying Union Pacific so I set out to remedy that this week. Six of us set out to make our fortunes buying up railway stock. In UP, players are building train routes across the USA for 10 train companies and buying up shares in those companies. There is also an 11th company, the Union Pacific, in which you can buy shares but no routes are built. You are basically trying to gain stock majorities in those companies in order to gain dividends that are awarded four times in the game to the highest and second highest shareholders in those companies. Whoever accumulates the most in dividends by the end of the game is the winner. The UP stock gets very valuable in the middle- to end-game and, after a slow start when no-one bought UP shares, once they started to be snapped up there was a deluge. The first dividend saw John take a slight lead by being able to gain first and second majority in one of the biggest companies. Timing is everything in this game. Predicting when the next dividend is going to be called and slapping down stock just in time will often see you do well. Mark K kept missing out, while I scored well especially in the third dividend. However, by that time, I knew Nige had the UP majority sewn up and he took no chances by declaring his remaining interests immediately after the third dividend. John did likewise, moving him into second place in the UP, and then proceeded to draw the final dividend card. When the tallies were made, John and Nige were tied but I had just held on thanks to my good third round scoring. 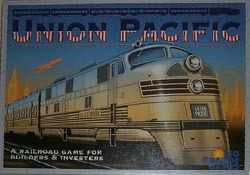 Union Pacific is a good game and is very similar to Airlines. Those of us that had played both had a slight preference for the earlier game (Airlines) as I think it is slightly more streamlined. However, UP does add an interesting extra element and is very nicely produced. Definitely one to play again. 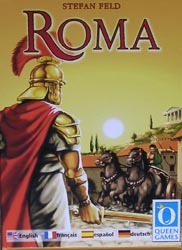 We finished off with this recent Reiner Knizia card game. The players are witches adding potions to three cauldrons to make an evil brew. However, if the pot overflows, the player causing this to happen takes penalty points and the pot has to to be started again. Each cauldron will only take cards of one colour (or a neutral â€œpoisonâ€ card). The cards are numbered between 1 and 7 and once the total in a cauldron exceeds 13, the player adding a card takes all the cards already in that cauldron as penalties and restarts the pot with his card played. Once all the cards have been played, the round ends and whoever has the most cards in each colour is allowed to discard all the cards he has in that colour. Then the remaining cards in hand each count 1 penalty point, except poison cards which each count 2 points. After a set number of rounds, whoever has the fewest penalty points wins. This is a great light game, which plays fast and has a bit to think about but in a fairly relaxed way. Do you try to avoid taking any cards at all (pretty difficult) or concentrate on a single colour, hoping to discard them at the end (easier but painful if you get it wrong). Also people have a nasty tendency of putting poison in the pots and these canâ€™t be discarded. In our game, I got completely stuffed in the first round, taking a massive 14 points. Ouch! Mark G didnâ€™t fare much better gaining just one point fewer. It soon became obvious that this was turning into a three horse race between Mark K, Nige and Phil. Although Mark K took a 6 point cushion into the final round, the others managed to leave him with 8 penalties in that round while they took none. This allowed Phil to squeeze through for the tightest of victories. 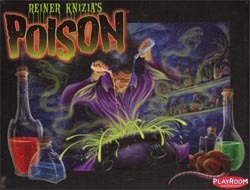 We all enjoyed Poison as a nice end-of-evening game, especially Phil and myself. Nige rated it a bit lower than the rest of us because it was just a bit too much fun. 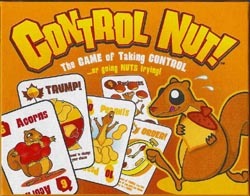 An excellent game to play with the family. “Each player is the chief of a Himalayan high plateau tribe trying to extend his tribe’s influence in the religious, political and economic spheres. The goal is to become the most proserous caravaneer in all of the Himalaya. The board shows 20 settlements consisting of 6 houses, 8 temples and 6 monasteries; furthermore the settlements are connected by either dirt tracks, ice track or stone tracks; the map is also divided into eight regions (the spaces between the tracks linking the settlements). The players collect goods (salt, barley, tea, jade and gold), make offers to monasteries, send out delegations to different regions or bargain to increase their livestock. The game is played in 12 turns representing the months in a year, resulting in a length between 60 and 90 minutes. During setup, 25 goods are deployed in blocks of 5 over 5 randomly chosen settlements. Of the remaining settlements, five get an order, again randomly determined. The players then deploy their caravan marker. During play, each secretly plots his caravan’s moves of up to six steps. Roads between cities are either dirt tracks, ice tracks or stone tracks. The action markers are likewise marked and have an additional hands symbol which allows you to program a transaction in a settlement. On the back is a sleeping yak which represents a pause in the action sequense. This programming phase is limited to one minute. It is this excellent victory determination process that sets the game apart. It is extremely clever and ensures players have to do enough in the religious and political areas to keep them in with a chance. The second-guessing aspect of programming moves is also very nice, although I had Nige worried when I described the game as RoboRally in the snow. In our game, Nige seemed to get off to a good start and was able to build a stupa on a couple of the important monastery locations. Mark G lagged behing in religious influence and it became clear that he was going to be eliminated first. Political influence was much tighter with Mark K and I both controlling 3 regions and Nige could only grab two. That left just Mark K and myself in the yak battle (economic influence) and Mark K had squirreled away quite a few more of these than me 30-23, so he claimed the victory. 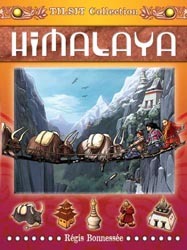 We all enjoyed Himalaya a lot and I can see why it got its SDJ nomination. Even Nige was ok with the programming bit so those who hate Robo Rally need not be put off. Very good. Next up was this second release by the Lamont Brothers and this time it deals with the exploits of sheep rather than frogs. The game is very abstract in play but the superb playing pieces make the game look very interesting in play. 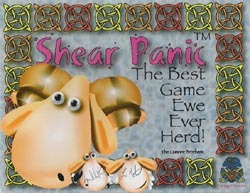 Basically each player has a number of different moves in which they can manipulate the sheep flock’s movement. The idea is to get your two sheep in the best positions you can whenever scoring takes place. There are four phases to the game and during the first and third phases, scoring occurs at the end of each player’s turn. In the other phases, scoring only takes place twice per phase. Your choice of action also helps to determine when the second and final phase scoring takes place, so giving you another thing to think about. At the end of the game, whoever has the highest number of points wins. This game was qute clever and a bit of a brain-burner, as players try to work out their optimum moves. However, with our group, this made the game drag on way too long and it far outstayed its welcome. Also, the game had a bit of a kingmaker problem as Mark K, who was out of the running, had to choose the final move of the flock and the result would determine whether Mark G or I won. Naturally, this meant Mark chose on the basis of Hall of Fame standings rather than optimising his own position and Mark G was able to record his first victory of 2006. In summary, cute pieces, dry game play but too long for our group to see it being played regularly. Shame, as the sheep are great.